My yoga instructor Bryan has a gift of giving people joy. He loves yoga and he has passion to share his love with his students. His class is not just about exersises. It is more about feeling good. Someone told me that he never missed a class (except his vacations) in they don't even remember how many years of his teaching. He starts his class with a breathing exercises and a short story. It could be a story about his cat Cinnamon, who decided to go for a walk on a roof just before pouring rain starts. Or about his four years old nephew, who likes to repeat new words in his cute four years old way without knowing what on earth does that word means. Those little stories bring calm and comfort right from the beginning of the class. Then each week he has a word of awareness. Few months ago awareness was about simplicity and de-cluttering of our lives. Thank you, Bryan! I was so ready to simplify and de-clutter my head, to start, and everything else to follow. First thing was to prioritise. Keep a few very important things and let the rest fell off the wagon. Rotation is appropriate but the wagon can hold just enough. So when I started to "organize" my head, I've noticed that questions like: What's for dinner? Lunch? Do I have all of the ingredients? Is it going to take all evening to make? took a lot of my time and my "hard drive"space. 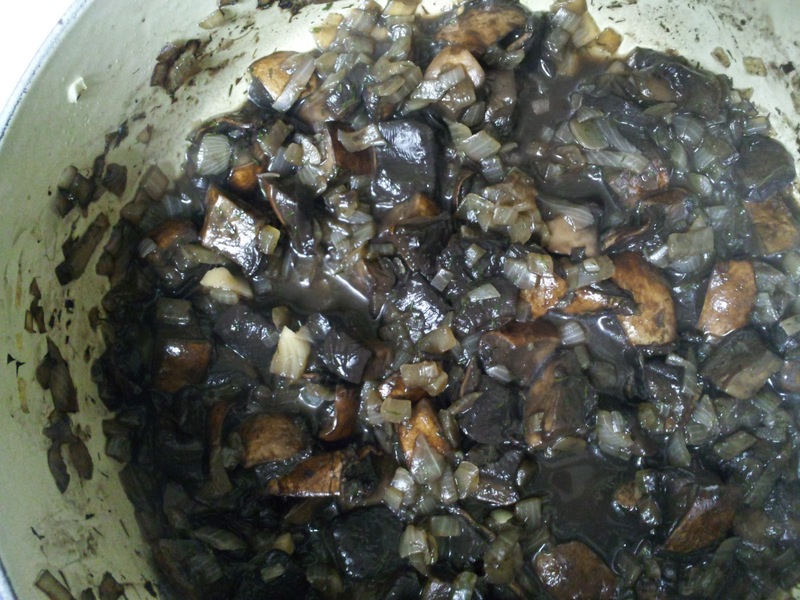 I was often frustrated about not being able to cook something new because I didn't have all of the ingredients. Or I had the ingredients, meal came out good, but everyone looked at me at the dinner table with comments: we want just some basic pasta or potatoes and fresh salad. There! Basic! Simple and affordable. No stress. So here is No Stress Dinner from yesterday's post. 1. 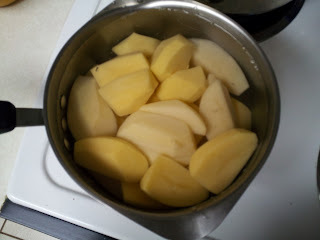 Peal 5-6 potatoes, put in a pot to boil. 2. 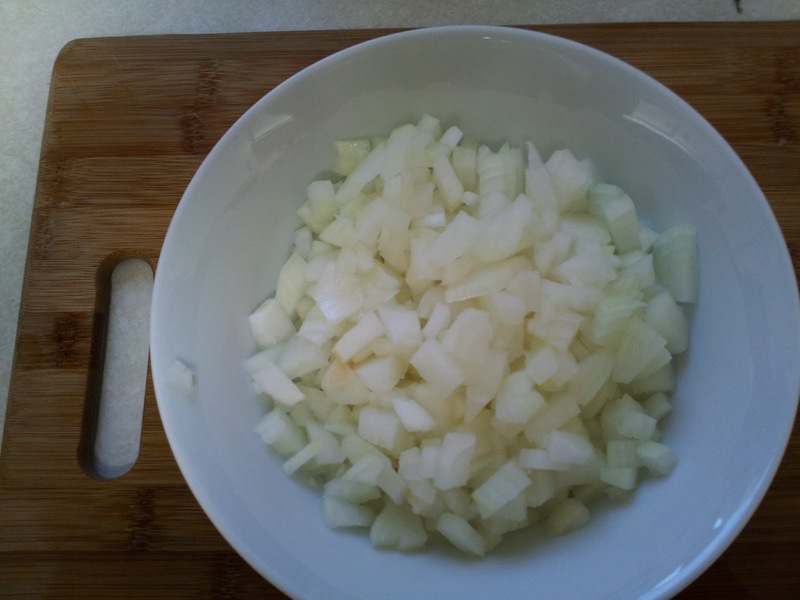 Chop 2 medium size onions. 3. Dice 4-5 portobello mushrooms cups and stems. 5. 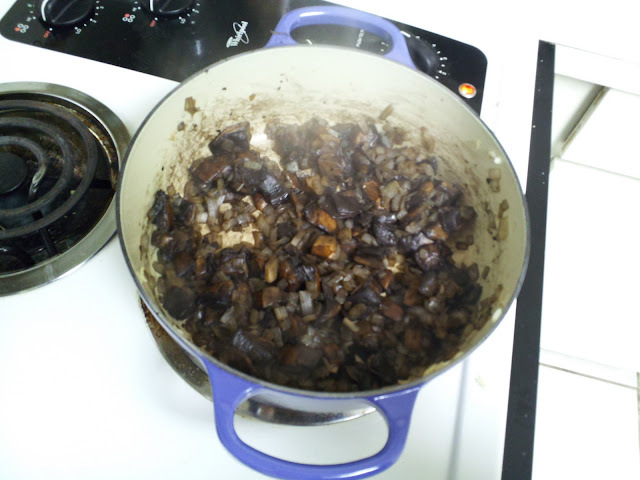 Add mushrooms and steer for another 4-6 min. 6. 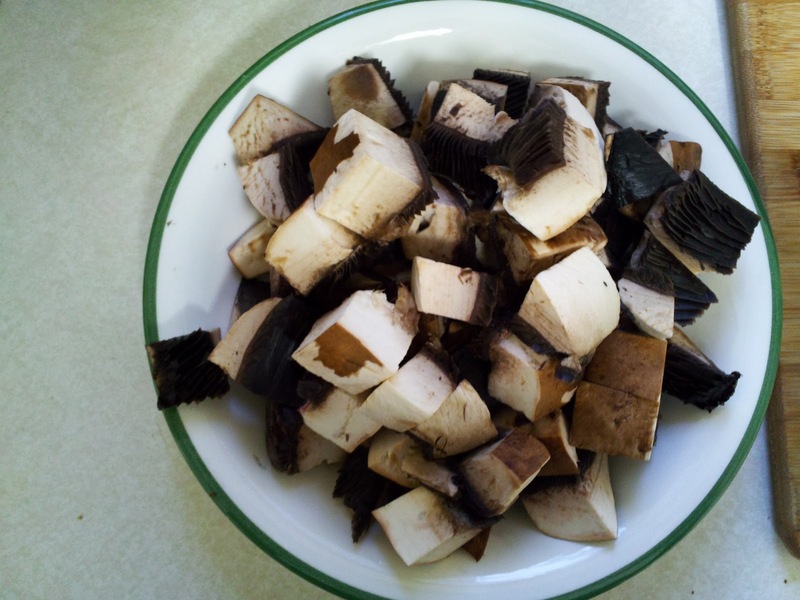 Add up to a cup of mushroom broth, any other broth of your choice, or just plain water. Wine is optional, just a little. Turn heat to a medium and simmer for another 5-7 min. 7. Taste. 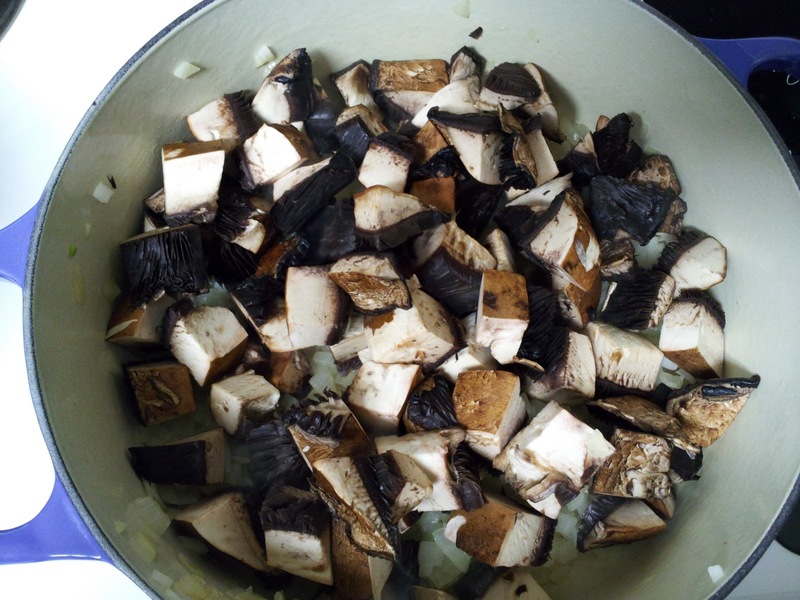 If you used broth, it may need just some herbs and black pepper. Or it may need some salt. Add a pinch of salt and taste again. Steer. And taste again. I love dill so I add it to almost every meal I make. I keep a big jar of dried dill weed in the kitchen handy. Dill gives each dish this comforting old time favorite flavor and is good for you. 8. By this time potatoes should be ready too. Pour water out, reserving half of the cup and mash. 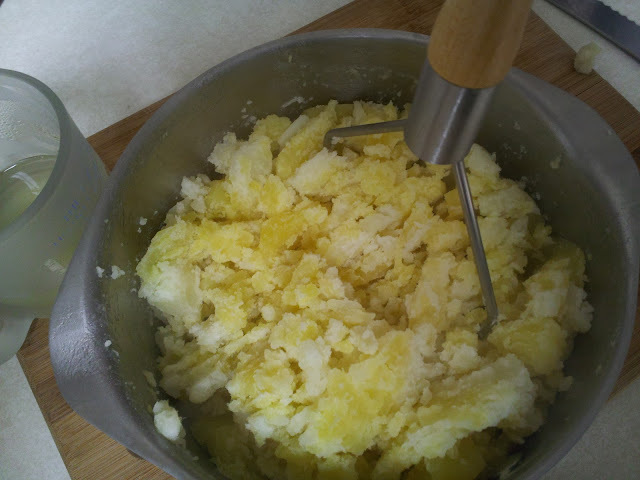 If potatoes are too dry for you, add some of that reserved water and mash again. 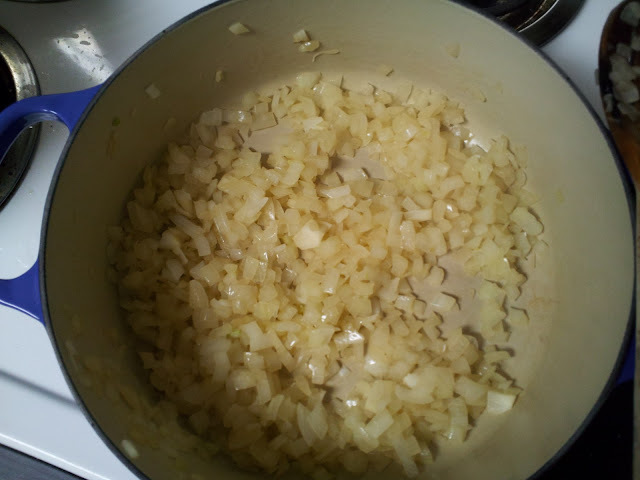 Add some granulated garlic and dill for flavor. 9. 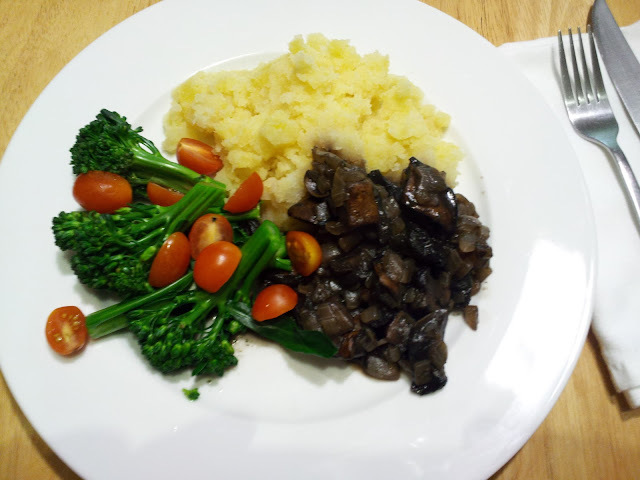 Design a plate: scoop of potatoes, scoop of mushroom and any greed, red, orange, yellow color vegetables you have available. I had some broccoli and cherry tomatoes. Dinner is ready. Bon appetit!